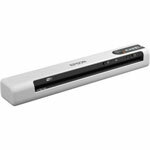 The wireless portable scanner with best-in-class speed. The Epson DS-80W Wireless is the fastest, smallest, and lightest, wireless mobile single sheet fed document scanner in its class. With a ground breaking speed scans a single page as fast as 4 seconds. Capable of scanning to a Windows PC, Mac, iOs, and Android device.